Sleeping Hammocks are great belongings to hang around penchant in open. We manufacture and supply a variety of hammocks with comfortable nets so that the hours of one's leisure is passed comfortably. Our hammock nets are made of strong fabrics but knitted in a way to give maximum comfort. 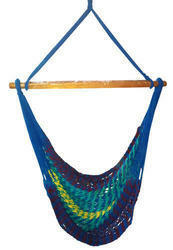 We offer knotted and knotless hammocks. We excel in supplying knotless hammocks of all sizes and also customise as per clients requirements. 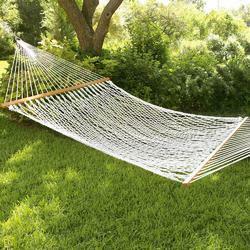 We are one of the leading manufacturer, exporter and suppliers of premium-quality Chair Hammock. They are manufactured at our spacious infrastructure facility in compliance with the prevailing industrial quality standards. These chairs are lightweight and boast of high carrying capacity. They are sturdy and durable. They are highly resistant to damage. These chairs have a glossy and scratch-resistant surface. They are suitable for repeated usage. They are available to clients in different shapes, sizes and colours, which can be customised as per the client’s specifications. They are supplied to clients within the specified time-frame at economical rates. We also export them overseas through our hassle-free shipment process.